So I'm pretty brand new here. I've been lurking the forums trying to find a solution to my annoying scars, but so far, without success. So far, I've tried quite a bit. I have also tried silicone gel sheets. I feel as though they flattened them and smoothed them out a bit, but they're still quite visible, and are tedious to apply every night. Almost every other night I massage the area, in hopes to loosen up the skin, but of no avail, yet again. If anyone can help me out, to primarily flatten them, and if anything fade the dark pigmentation, I'd be eternally grateful! I've been struggling to fix this on my own, but nothing has been coming to light. I hope someone can help share some insight with me, I know a lot of you are probably much more knowledgable about these pesky buggers than I am. your skin looks otherwise clear, what were these from acne cysts? What was the concentration of the cortisone injections? 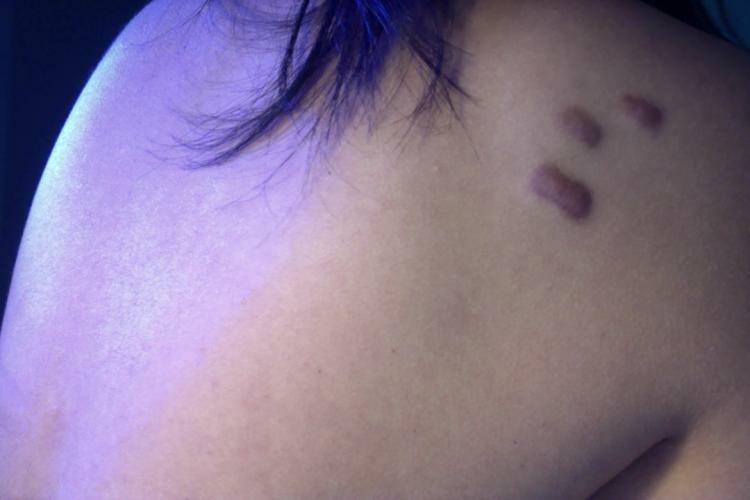 For keloid scars like this, they would need a pretty high concentration. Some doctors also inject a combo of 5-fu and Kenalog. I will definitely need to get back to you on that one. From what my doctor said, he said they were quite low because he didn't want to risk them becoming indented. Do these look like keloids? I've been having trouble distinguishing if they are keloids or hypertrophic scars. I assumed they were hypertrophic because they stayed about the same size as a pimple I'd get if it were on my back. Hm, maybe I've been looking at the wrong information. I had some pretty bad acne back in high school. Went on accutane and it cleared up almost everything for the most part. From what I remember, these scars were left from some acne I may have picked. It's so far back, it's hard to remember exactly. They are hard in texture though, and don't hurt. Have no idea what to do at this point haha. If it makes you feel better, they really don't look unattractive. Aw, thanks. I am quite thankful I can easily cover them up. I used to have much worse acne on my face which couldn't be covered so it is relieving. Just wish I could wear backless dresses without being self-conscious ha. Kenalog or cortisone injections come in 2 strengths, 10mg/ml or 40mg/ml. These are then diluted with saline to get lower concentrations. I think it failed probably because your doctor admitted he used a low strength. If you inject Kenalog 40 into normal skin, you would get severe atrophy like a crater. On a hypertrophic scar, I think a higher strength and 5-FU will help to flatten this over time. Kenalog is just the brand name of cortisone. Like Advil is the brand for ibuprofen. Actually he probably diluted the 10mg/ml in half and injected you with something closer to 5mg/ml. Ah. I see. I guess this is the only solution to flattening them then, eh? As for the colour, any ways to fade them using topicals instead of laser? I suppose you could also excise them, but that would be the most extreme method. Plus that area is very mobile, so that might put too much tension on the incision and it would stretch into another scar. I'd say exhaust your options first with higher concentrated kenalog and 5-FU before doing something extreme. I would actually get Vbeam, not IPL. Vbeam is more focused, while IPL is for global redness like facial flushing. Maybe I'll reconsider now that you both are giving me some green lights. I've been mainly massaging them, trying different topicals and tried the silicone sheets again a few weeks back, but if the injections are my best bet, i'll make another appointment with my derm.